Today’s post was written by Jeff Teper, corporate vice president for OneDrive and SharePoint. OneDrive for Business has made significant progress in the last six months, and was recently named a Leader by Forrester Research in “The Forrester Wave™: Enterprise File Sync and Share Platforms, Cloud Solutions, Q1 2016.” You can read the report here. It’s an honor to get industry recognition like this, but we know there’s always more for us to do to improve the service. Today, we’re announcing important improvements and new capabilities in our sync, browser and mobile experiences, as well as new IT controls for administrators. In December 2015, we released the first version of the Next Generation Sync Client, which we now refer to as the new OneDrive sync client. The new OneDrive sync client has dramatically improved sync reliability and performance and contributed to tremendous growth in OneDrive for Business total storage and active usage. Windows 8.1 support—This completes our commitment around Windows OS support (7, 8, 8.1 and 10). Office 2016 integration—In conjunction with an Office 2016 update currently rolling out, key features such as real-time co-authoring, open documents from the Most Recent list and share documents from within the Office app will be available. 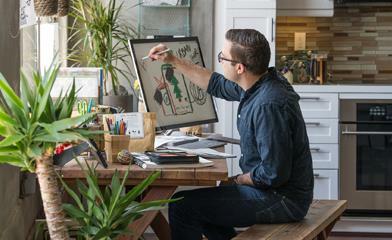 Improved setup—Now it’s easy for anyone to get and install the new OneDrive sync client. No more registry keys needed on Windows or Terminal window on Mac! Seamless client migration—If you are running the previous sync client (groove.exe), this update seamlessly transitions without requiring a resync. For full details go here. Pause sync—A handy feature when you want to suspend syncing for a period of time, like when you are tethered to your phone or using Wi-Fi on an airplane. View files online—You can now right click any document in Windows Explorer and select “view online” to navigate to the OneDrive for Business file or folder in the browser. Sync any file type you want—We’ve added support for .json, .aspx, .swf files and more; you can now add any file type to your OneDrive for Business. Block file types—IT admins can now block certain file types from syncing, such as PST or MKV files protecting limited bandwidth. Performance and reliability improvements—Give small files in particular a big boost in upload and download speed. Manage bandwidth—By the end of June, we’ll deliver IT controls to throttle bandwidth consumption of the client. Extended Windows Explorer integration—A simple right-click action to get a link or share files directly in Windows Explorer. We’re introducing a simple way to remove files and folders from the “Shared with me” view in the browser experience. Removing an item from the “Shared with me” view doesn’t delete the file; it can still be found via a search, so it’s not lost if you need to get back to it. Easily remove items from your “Shared with me” view. 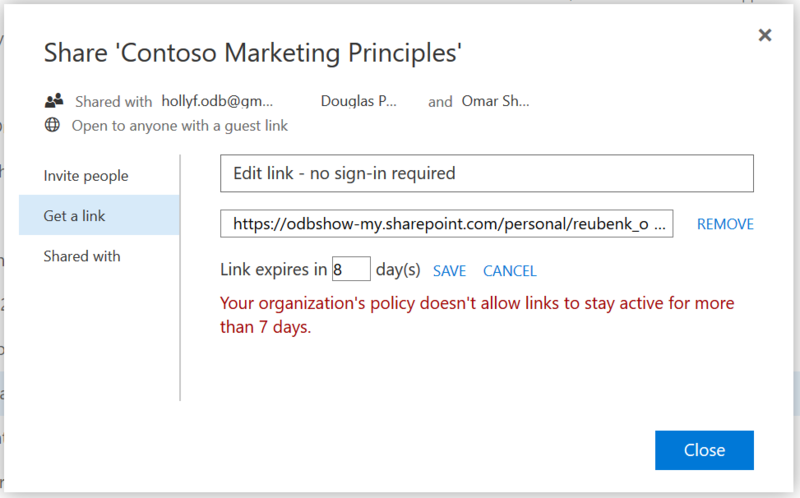 Sharing with people outside your organization is now a whole lot easier! We’ve streamlined the process for an external recipient who doesn’t have an Office 365 or Microsoft account to open files you share with them from OneDrive for Business. Now, anyone without an Office 365 or Microsoft account who receives a file invitation just needs to enter an email address or phone number and a password, then confirm their account (one time only), and they’ll have access to the file. Simplified creation of a Microsoft account. This update is a big one for our iOS and Android apps! We’re integrating Outlook mobile with OneDrive for Business, so you can share files through email on both iOS and Android—this update will roll out in the coming weeks. Composing an email on an iPhone and attaching a link to a OneDrive for Business file is quick and easy. We’ve introduced a richer sharing experience in the OneDrive app for Android, including a fantastic new PDF viewing and annotation experience and an embedded Office Lens experience. You can now take a photo of the whiteboard after an important meeting and have it automatically converted to a PDF file and uploaded to the OneDrive for Business folder of your choice, in one simple process. We’ve included support for Office 365 Data Loss Prevention (DLP). This builds on the DLP integration already in the browser experience. This update will start rolling out today and be available to all users within a week. 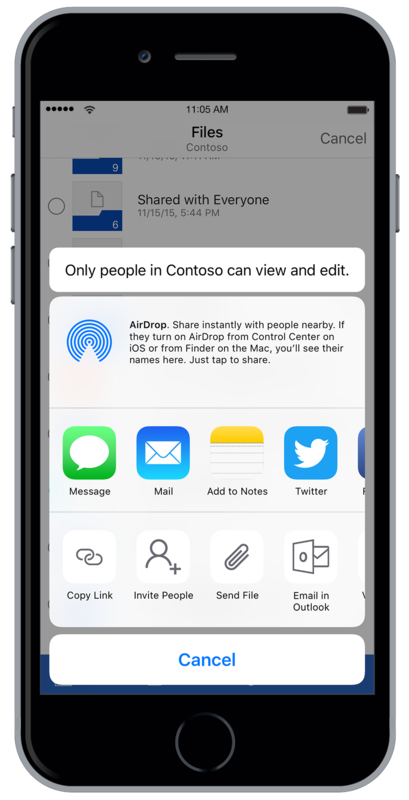 In the OneDrive app for iOS, we have a new, richer sharing experience including SMS, Mail, Outlook Mobile, Copy Link (both Edit and Read-only links), Invite People and others. You can also save files to OneDrive for Business from any iOS app. As with the Android update, this iOS update also supports Office 365 Data Loss Prevention (DLP) policies defined by your organization. Again, this update will roll out to all users in the next week. This iOS update has much richer sharing options for OneDrive for Business files. One of the great things about Office 365 is the ability for IT to get an unprecedented view of what’s going on with your critical business data across email and files. We recently started to roll out a new reporting portal in the Office 365 admin center, where you can see key usage metrics for all of your Office 365 services including OneDrive for Business. Comprehensive usage reporting across Office 365 services is now available. In addition, along with making external sharing easier for end users, we’re also giving IT administrators more controls over who their users can share with. For example, perhaps your organization is OK with files being shared with external parties, but doesn’t want employees to share files with certain organizations, such as direct competitors. 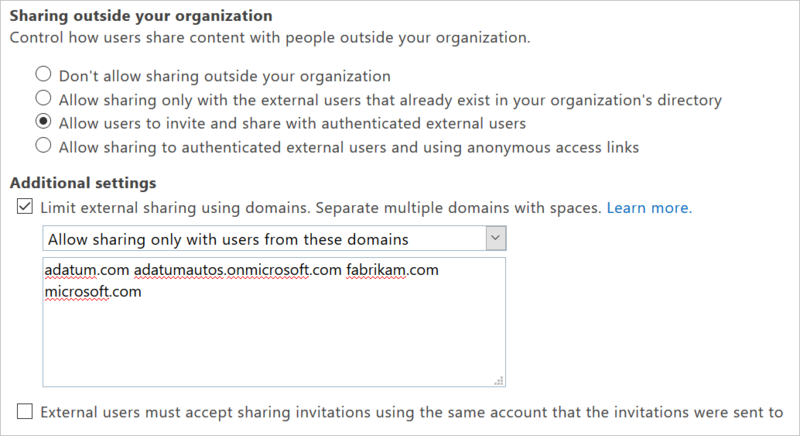 Now, IT administrators can set up a list of domains that people can share with or a list of blocked domains (but not both). This new capability is currently rolling out and will be available to all OneDrive for Business customers by the end of April. Setting a list of domains that users can share with. In September 2015, we rolled out the ability for end users to define an expiration date for an anonymous or guest sharing link. Now we’ve added the ability for IT to set a tenant policy (RequireAnonymousLinksExpireInDays) that makes expiration dates mandatory for anonymous or guest links and assigns default expiration period (e.g., 7 days). Users can still set an expiration date that is shorter, but not longer, than the default period. The user experience if they try to set an expiry date beyond the organization’s policy. We know that one of the keys to having a productive and useful collaboration space is a powerful and flexible platform to build on. There are a number of new options for developers who are building apps that connect to OneDrive for Business, including Webhooks preview, where developers can easily get push notifications to changes occurring in OneDrive for Business, an updated file picker for JS, Enhanced flexible sharing via the OneDrive API and App folders on OneDrive for Business. The developer options for OneDrive for Business are constantly getting richer and more flexible. We are excited about the solutions our partners are building and the breadth of solutions available. You can check out examples of these partner solutions on the OneDrive for Business ecosystem page. There’s always more to come! So there you have it, some great new capabilities for everyone who uses the service or manages it. What’s great is that you can get started with almost all of this today! This new set of capabilities marks another step forward in the value that OneDrive for Business provides as a key component of your Office 365 investment. As always, give us your feedback on UserVoice and make sure you check out the Future of SharePoint and OneDrive event on May 4, where we’ll have more OneDrive for Business news to share—don’t miss it! The event will be available on demand after this date as well. There’s so much more to come with OneDrive for Business in 2016—stay tuned!